March came in like a lion, and its going out like a goat! Yes, a goat. The first of the month brought rain that turned into snow showers. More snow fell and we endured cold temperatures during the middle of the month. Then we were blessed with about a week of sunshine and mild temperatures. Today the skies are cloudy and gray. That’s spring in the Midwest, isn’t it? Our weather can be unpredictable. 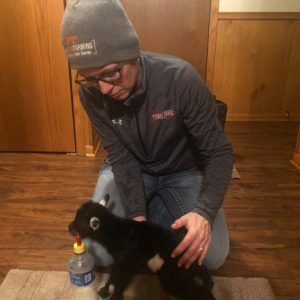 Our kidding season came to a surprising start on Thursday, February 28, when the dwarf-fainting cross goat my daughter was given for Christmas went into labor. To make a long story short, that first-time mother didn’t want to claim her baby. Her newborn baby was barely bigger than a 20-ounce Pepsi bottle, and he was weak from making a traumatic entry into this world. We did what many farmers do when their livestock needs some tender loving care, and we brought the kid inside until he regained his strength. We named him Lil’ Romeo. As he got stronger, Lil’ Romeo developed the sweetest personality. He also developed a following! 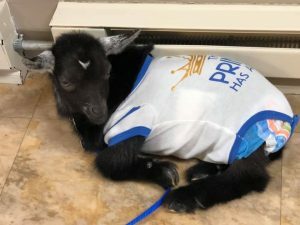 People enjoyed the “baby goat cam” videos that we posted on Facebook, and it wasn’t long before staff at our local care center asked if our baby goat could come for a visit. Lil’ Romeo turned four weeks old yesterday, and today he made his first public appearance. To mark this special occasion, my mom bought him a little outfit that reads, “The prince has arrived.” We also attempted to fit Lil’ Romeo into a toddler brief, and the residents at the care center loved it. I really enjoyed overhearing a group of ladies at a table talk about our little goat. 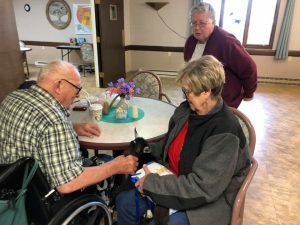 The smiles on the residents’ faces were priceless. One lady told me how good it was to see livestock again. She told me that she and her husband were dairy farmers. Another gentleman told me that he raised horses. It was clear that our animals brought back great memories for them, and that warmed my heart. 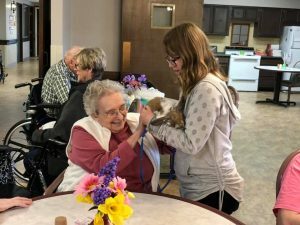 What a great reminder that we can lift our spirits by making another person’s day. Perhaps you even want to “bake someone happy” this weekend. Brighten up the greyest of spring days by making your own rainbows. Kids will love dying the batter into rainbow colors and watching their creations “puff up” in the oven. 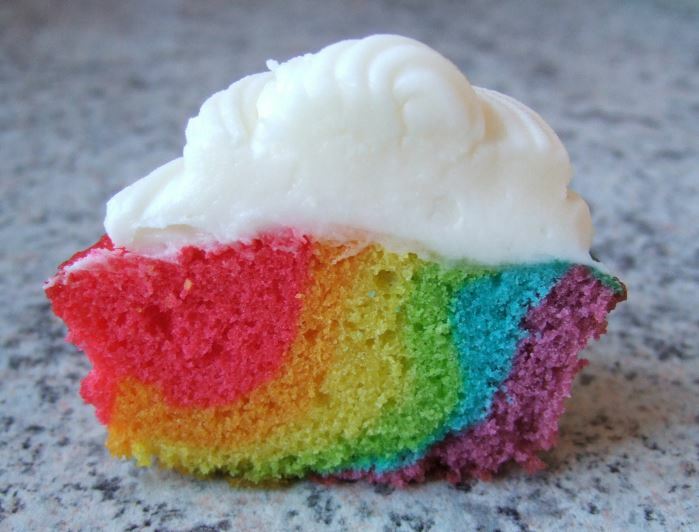 This rainbow cupcake recipe is courtesy of Laura Cunningham, Latham Seeds’ marketing manager. 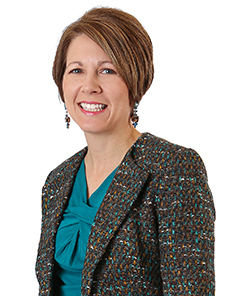 You can follow her on Facebook and Twitter (@SkyViewFarms) to learn how she raises cattle on her North Iowa farm. Line muffin pan wells with baking cups. Make the cupcake batter by preparing the cake according to the direction on the box. Next, divide the batter evenly between SIX, small bowls. Following the directions below, dye each batter a different color. Quantity of drop is shown under the directions. As you go, gently spread each layer of the batter with the back of a spoon to cover the color underneath. But be careful not to mix the colors! Bake the cupcakes, according to the cake directions. Before serving, remove the paper wrapping to show the colors. Top each cupcake with a "frosting cloud." For added affect, find small gold-wrapped chocolates to add for the "gold at the end of the rainbow."